for writing a VST / MIDI plugin without your toolkit, what resources do you recommend to investigate? I'd begin with becoming familiar with Steinberg's VST SDK v2.4. It's in C++, though. If that's not a stumbling block, I'd get the SDK. Once you get it and the examples that come with it to compile, you can start digging into them to learn how to create your own plugins. There's a forum[^] over at KVR where a lot of VST developers hang out. We'd be happy to answer your questions there. I've written a few VST/MIDI plugins, so I'm familiar with the steps needed to write one. Thanks man, the way you respond is really wonderful, thanks for the replies, I'll investigate what you said. There is also another, maybe a simpler way to do it: Look here, this is a virtual midi loop-through driver called LoopBe1, which will create another Midi-In and Midi-Out device in your computer. Now, you can write your software using the Midi toolkit. The midi messages shall be written to the LoopBe1 device. In your DAW (Cubase), use the LoopBe1 as midi device for your VST instruments - that's it! If you want to be on the list, just reply to this post with a link to a website or a one sentence description of your project. I'm extremely thankful for Leslie's excellent toolkit. I used it when I created the software for the Gigajam music tuition software, that is used by thousands of school kids to learn to play an instrument. The toolkit is used to playback lesson files, record the pupils performance and then playback their performance with the lesson backing track. And it works brilliantly. I've made a program which was intended to be an patch editor/librarian for the Access Virus C series. I haven't worked on it for ages, but the patch librarian functions work well. I might finish it one day. I'm just starting a new project which is an app to make the Korg PadKontrol do whatever I tell it to in Native Mode. -play Noughts and Crosses(or any other simple game playable on a 4x4 board). -make words scroll across the 7-segment LED. What a nice idea. I have used Leslie's toolkit for one small and one slightly larger project now and I have to say this toolkit is very well done. The first project was a simple 'pitch bend rounder' application that I created to sort of emulate a Haaken Continuum using the R2M ribbon controller from Doepfer. Basically what it does is more or less intelligently round the pitchbend values for the target device whose pitchbend range is set to, for example one octave. Anyway, a big thank you to Leslie for making this toolkit available. Thanks a LOT for this piece of code, it's exactly what I need and very nicely written. 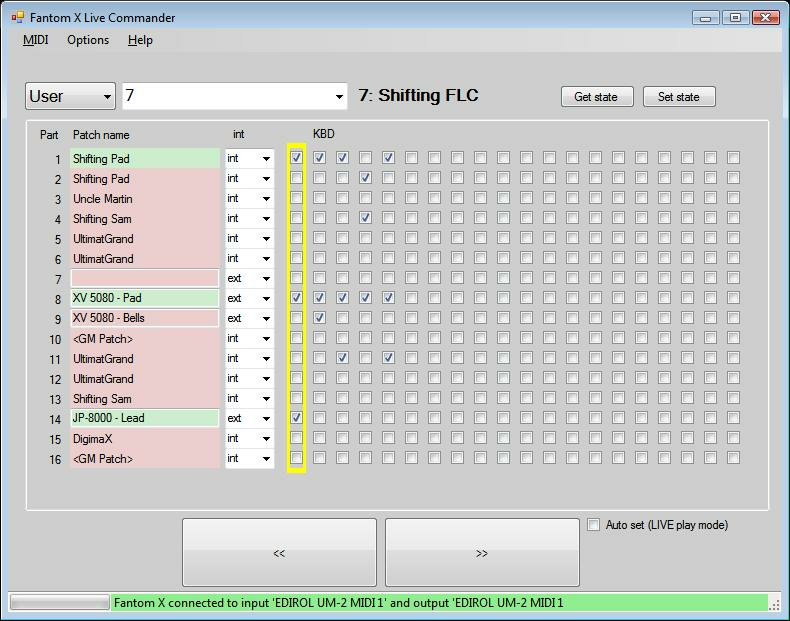 I use this program to extract out of MIDI file the basic MIDI key information and feed it to a micro-controller and Yamaha chip to play the tunes (chiptune they call it). Hello, I'm trying to write an application that loads a midi file and advances (or plays) the midi file when the T key (or any input method, really) is clicked. Would that be possible to do with this toolkit, and are there any suggestions on how to do it? My problem is that I am not experienced with instruments and MIDI at all. Great framework. Is it possible to access the name of a track which is stored in a midi file (Acoustic Guitar, Second Guitar, Drums)? Additionally I want to display only the current selected track in a piano control when playing a sequence with a sequencer. How can I determine which track has send the channelmessage received by the ChannelMessagePlayed event? How to create wav or mp3? Now I can play midi notes using this amazing tool, but I need also capture the sound and save it as mp3 or wav. Is it possible? Re: How to create wav or mp3? Not using just this toolkit. It can only record and playback MIDI data. I send midi events using OutputDevice.send to virtual midi router, recording what i`ve sent from input of that router in Nuendo. So I discovered that the delay between the fire of OutputDevice.send and recorded message is about 100-120 ms. When OutputDevice is a synthesizer, this delay also exists(I hear it=) ). Project is compiled as release and is not debugging. Howewer, when I use the same router, setting in Nuendo it`s output to playing track, and recording it`s input, delay is less than ~1 ms. So delay is not connected with router. Question: =) can this delay be minimized? I need a strong realtime.. 100 ms is very big delay for what I`m trying to do.. I also tried to output generated messages using OutputStream, writing and flushing it, but didn`t hear any sound or have seen messages sent.. Maybe the solution is to send realtime generated events through OutputStream with DeltaTicks == 0 ?? or something like that? And if it is not difficult for someone, please post an example of using OutputStream with realtime generated events.. Thanks. Is there a specific reason you are using OutputStream ? None of Leslie's own code makes use of the OutputStream class and it isn't clear why you'd use it in preference to OutputDevice. It appears to involve a buffer, which is probably adding to your latency. In my apps I use the Send methods on the OutputDevice class and latency is acceptable. Of course you then need a way of timing your messages, which I guess is why you were using OutputStream ? I use Leslie's Sequencer for my timing, but you could just as easily use one of the clocks instead, if you are generating MIDI messages on the fly (rather than playing back MIDI files or passing thru messages from an InputDevice). Here's my little contribution to this great library. I added a way to send custom reset sequences to MIDI device, like some players do (see VanBasco). First, thank you for this bit of code. Could you, or anyone help with this? My system: Win 8.1 Pro 64. I call the Reset method from my constructor. I would be grateful for a solution. A good starting point would be to check their value when you have the exception. It's an attempt to write to protected memory. As it's to do with an imported winmm.dll and these figures don't mean much to me I'm at a loss. Have you used your Reset method on a 64 bit system? I've just implemented what you've given and so presumably it should work. No, my code was for a 32bit only software. AFAIR I hadn't a 64bit OS in 2009. Maybe there's something wrong in midiOutUnprepareHeader() declaration and/or parameter marshaling. I'll take a look at that link. Need a help with my "little" project! Thanks again Leslie for your good work! Your ToolkitDemo made it possible for me to learn CSharp directly on the topic that i need it for! But now to my "problem". I try to realize a kind of a stepsequencer/arranger program. The idea is to create a software that is inspired by StepSequencers that are implemented in Inst's like the good ol' TR or TB machines. Or the more complex form in the Machinedrum Models. But why only set notes in steps? I want the possibility to set every parameter to a track in which i can edit the values i want to. In the time of Racksynths which are only playable over an external keyboard we do need a good StepSequencer! But enough with the talking! Allthough i only work with CSharp since a month, i managed to realize at least the optical layout of what i want to do. The code you'll find here. It does work. But not nearly in the way it should work in the end. The values are edited via the pianokeys or the big Scrollbar in the MainForm. Just play the key, u want to have and then push the note-Button in the StepTrack. You will see in the code that it is really chaotic and "noobish". But to get the idea it is nearly pefect. But to realize it, i need some help. Since this program should become a opensource project, i would need some people who are interested in doing this with me... may be on long term, we could build a "luxus" version for commercial using. But this is not definitly. It depends on the people. I hope u get the idea and someone is interested. If you have some questions please ask! And Leslie, i hope it is ok for you, to look for people on "your" site. But since i do need people who knows your toolkit it is the best place in net to ask! sorry if my questions will too simple but I've never did something with midi. I need generate on my pc midi note depend of external data (from web service). Eg. if external data is "1" I need generate note "c", if "2" - "c#" etc. Aftr I ned to send it to external device (by usb-midi cable). 1) I understand that Data1 it is kind of note. But it play me piano. It is important that it is piano? I need send just note c or d. External device will check only note and will not play it. Can I send pure note without kind of instrument? 2) Where is list of notes and numbers (eg. d# it is 55 in Data1)? 3) If on my computer are 3 devices how i can to choose it? Can I take names of devices and numbers and put into combo box? I've tryed to find it on forum but you are asking about most dificult things.